The Peru national football team represents Peru in international football competition and is managed by the Federación Peruana de Fútbol (FPF). Founded in 1927, the team's home matches are held primarily at the Estadio Nacional in Lima. Peru has won the Copa América on two occasions, and qualified for four FIFA World Cups and two Olympic tournaments; reaching the quarterfinal stage in both. Peru's traditional footballing rival is Chile, but the team also has a prominent football rivalry with neighboring Ecuador. Throughout its history, the Peruvian team's performance has been inconsistent. The side's early years saw World Cup participations and victories in the 1938 Bolivarian Games and the 1939 Copa América. Its 1950s side, which included Alberto Terry and Valeriano López, was considered to be among the top 20 strongest footballing nations of the decade, despite not winning any major tournaments. The golden generation of Peruvian football in the 1970s brought Peru back into the world view, with greats such as Héctor Chumpitaz, Hugo Sotil, and Teófilo Cubillas leading to the belief that a new footballing powerhouse had emerged. This team qualified Peru for three FIFA World Cups, and won the Copa América in 1975. Peru's most recent appearance in the final stages of an international competition was at the 1982 World Cup; the national team has not seen a major tournament victory or World Cup participation in over 27 years and was also temporarily suspended from international participation by FIFA in late 2008 due to allegations of corruption between government sport authorities and the FPF. Edin Osmanović (born May 20, 1964) is a football manager from Slovenia. He began his career in NK Rudar Trbovlje, and later coached many clubs in the Liga Simobil Vodafone (or First Slovenian Football League), the highest level in Slovenian football. With HIT Gorica he became the Vice-Champion of Liga Simobil Vodafone, entered the semi-finals of the Slovenian Football Cup, and went to The UEFA Cup Championship, making it his most successful club, and one of HIT Gorica's most successful seasons. With NK Korotan, he became the Champion of the Slovenian All Stars Competition, and entered the semi-finals of the Slovenian Football Cup. With NK Dravograd, he became the Vice-Champion of the Slovenian Football Cup. He coached several other clubs, including Publikum Celje, NK Rudar Velenje, NK Aluminij and ND Mura 05. He also worked with other coaches, including Stanko Poklepović. The Brazilian Football Confederation (or Confederação Brasileira de Futebol (CBF) in Portuguese) is the governing body of football in Brazil, and was founded on August 20, 1914 as the Confederação Brasileira de Desportos (CBD), meaning Brazilian Sports Confederation. Part of CONMEBOL, it organizes the Brazilian national competitions of the Campeonato Brasileiro and the Copa do Brasil. The state federations, which organizes the state championships, are subordinated to CBF. The organization also administrates the Brazil national football team and the Brazil women's national football team. It is based in Barra da Tijuca neighborhood, Rio de Janeiro, Rio de Janeiro state. 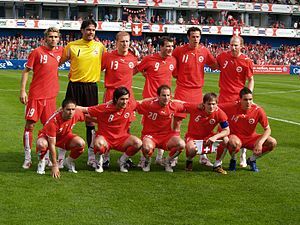 The Swiss national team pose before a 2006 friendly against China in Zurich. Controlled by the Swiss Football Association, Switzerland have reached the quarter-finals of the World Cup three times as well as winning silver at the 1924 Summer Olympics. Things have taken time to get used to, the weather's not great and people seem to drink beer all the time, but there’s nowhere I’d rather be playing. This page was last edited on 18 April 2019, at 06:28 (UTC).